The Sun is the most prominent feature in our solar system. It is the largest object and contains approximately 98% of the total solar system mass. One hundred and nine Earths would be required to fit across the Sun's disk, and its interior could hold over 1.3 million Earths. 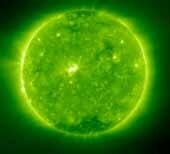 The Sun's outer visible layer is called the photosphere and has a temperature of 6,000°C (11,000°F). This layer has a mottled appearance due to the turbulent eruptions of energy at the surface. 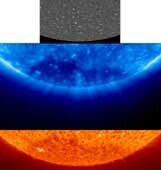 Solar energy is created deep within the core of the Sun. It is here that the temperature (15,000,000° C; 27,000,000° F) and pressure (340 billion times Earth's air pressure at sea level) is so intense that nuclear reactions take place. This reaction causes four protons or hydrogen nuclei to fuse together to form one alpha particle or helium nucleus. The alpha particle is about .7 percent less massive than the four protons. The difference in mass is expelled as energy and is carried to the surface of the Sun, through a process known as convection, where it is released as light and heat. Energy generated in the Sun's core takes a million years to reach its surface. Every second 700 million tons of hydrogen are converted into helium ashes. 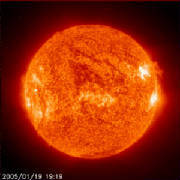 In the process 5 million tons of pure energy is released; therefore, as time goes on the Sun is becoming lighter. The chromosphere is above the photosphere. Solar energy passes through this region on its way out from the center of the Sun. Faculae and flares arise in the chromosphere. 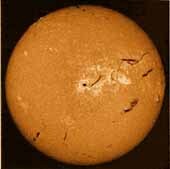 Faculae are bright luminous hydrogen clouds which form above regions where sunspots are about to form. Flares are bright filaments of hot gas emerging from sunspot regions. 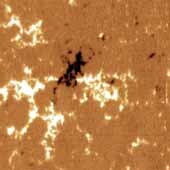 Sunspots are dark depressions on the photosphere with a typical temperature of 4,000°C (7,000°F). The corona is the outer part of the Sun's atmosphere. It is in this region that prominences appears. Prominences are immense clouds of glowing gas that erupt from the upper chromosphere. The outer region of the corona stretches far into space and consists of particles traveling slowly away from the Sun. The corona can only be seen during total solar eclipses. (See Solar Eclipse Image). The Sun appears to have been active for 4.6 billion years and has enough fuel to go on for another five billion years or so. At the end of its life, the Sun will start to fuse helium into heavier elements and begin to swell up, ultimately growing so large that it will swallow the Earth. After a billion years as a red giant, it will suddenly collapse into a white dwarf -- the final end product of a star like ours. It may take a trillion years to cool off completely. 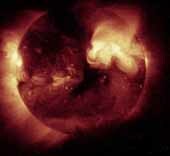 * The Sun's period of rotation at the surface varies from approximately 25 days at the equator to 36 days at the poles. Deep down, below the convective zone, everything appears to rotate with a period of 27 days. SOHO - Halo Mass Ejection Event. 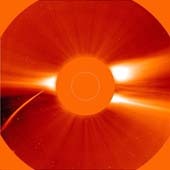 SOHO - Halo Mass Ejection Event - Zoomed Out. SOHO - Explosive Coronal Mass Ejections from the Sun. SOHO-6 Comet at 2-6 solar radii from the Sun. Man's Fascination of the Sun. The Sun's interior, photosphere, and corona. Sun's magnetic field, prominences, solar wind, aurora. Corona Animation of Solar Prominences. 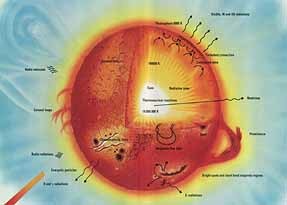 1993-1994 animation of the Sun as seen in soft x-rays. A QuickTime movie (15 Mbyte) of the above eclipse. Sources of the Solar Wind?